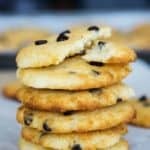 Coconut Flour Chocolate Chip Cookies | Chewy! If you missed the chewy version of almond flour chocolate chip cookies earlier this week, and you prefer using almond flour we recommend you check them out! But, these Coconut Flour Chocolate Chip Cookies are not only just as chewy, but slightly tastier in our opinion! These are great for all people, but especially people with nut allergies like myself! My nut allergy has been a curse, but also a blessing because we've used it to push us to make more nut free recipes. Why Are These Are The Best Coconut Flour Cookies? Simple. These cookies are soft and chewy on the inside with chewy crisp edge. Does it get better? Not only is the texture perfect, but it is nut free and our best chocolate chip cookie recipe by far. We've made three variations so we can say with confidence that these are the best coconut flour cookies! The base alone is delicious and perfect without the chips, which allows you to add your own spices and fillings, and have your favorite cookie made with a coconut flour base. The macros are also pretty sound, and when something tastes this good all you need is one or two cookies to satisfy that sweet tooth! Baking With Coconut Flour Is No Easy Task! One of the toughest flours to bake with is coconut flour! It took us several months to fully understand the impact it made on baked goods verse almond flour. That being said, naturally, this recipe took a few more tries than we would have liked, but anything for nut free chocolate chip cookies! The issue with coconut flour is its high absorbency - you can easily add more than needed, which ultimately ruins the batch! However, we have perfected a few other coconut flour recipes, such as our olive oil cake and low carb tortillas! Making these cookies is a simple task with a high reward. You, your family, and friends won't even know you're eating a low carb take on the classic chewy chocolate chip cookie! Just be sure to let them cool for at least 20-30 minutes before picking them up or they will fall apart. One of the toughest parts about working with low carb flours is that they need to cool and set after coming out of the oven - nothing is immediately edible! Wait time aside, you won't regret making these chewy coconut flour chocolate chip cookies today! TIP: If you don't have Lily's chocolate chips at home, you can use chopped up 100% cocoa bakers chocolate and liquid stevia (30 drops) to replace the chocolate chips! Recipe can be quickly added to MyFitnessPal - Search "KetoConnect - Coconut Flour Chocolate Chip Cookies"
Put the butter and cream cheese in a large bowl and microwave for 20-30 seconds, until soft. Whisk together until uniform. Add the eggs, heavy whipping cream and vanilla extract and whisk. In a separate bowl combine the coconut flour, erythritol, beef gelatin powder and baking powder. In two batches add the dry to the wet as you combine. Once the dough has come together fold in the chocolate chips. Using a cookie scooper or a spoon, make 10-12 cookies on the parchment paper. The dough will not spread in the oven so flatten out the cookies to the desired size you would like them. Bake at 350 for 17 minutes or until golden brown. Allow them to cool for at least 20 minute before handling. Enjoy! TIP: If you don't have lilys chocolate chips at home, you can use chopped up 100% cocoa bakers chocolate and liquid stevia (30 drops) to replace the chocolate chips!